“The biggest failure of public administration since the formation of the Commonwealth of Australia in 1900.” Australian Tax Office insider. “The result of having the wrong system where taxes are too high and a labour market which is over-regulated.” Liberal Party insider. We are talking about the broad, state-sanctioned, backdoor deregulation of Australia’s labour market, which has gathered pace as employers increasingly sign up foreign workers, not as employees, but as contractors. It is well documented that billions of dollars a year leak overseas via multinational companies and their aggressive tax schemes. There is, however, another “tax gap” that is not reported but is of national economic and social importance. That is, to coin a phrase, the ABN gap. The Australian Tax Office (ATO) set up its Australian Business Register around the turn of the century at the instigation of John Howard’s government as a way to help with the registration of business entities. It is an efficient system. Anybody wanting an ABN (Australian Business Number) can get one online within a few hours. This includes foreign visitors arriving to work in Australia. The question is, is it too efficient? And to what extent is it eroding Australia’s tax base and affecting the existing labour market? One insider at the Tax Office told me businesses were hiring tens of thousands of workers, instructing them to get an ABN, paying them less than the award – an estimated 40 per cent less on average – than they would if they employed unionised labour on PAYG terms. Union sources confirm the rising numbers of foreign workers are undercutting awards, and the tax take. By the time a foreign worker, often from China, has worked for two years and not paid tax (it is incumbent on the contractor with the ABN, rather than the employer, to pay income tax), the worker has often returned overseas and the Tax Office is compelled to write off the “tax debt”. The interesting aspect of all this is the absence of political debate and media coverage. It is fair to say that many on the right would deem the deregulation of the workforce to be a good thing to keep wages competitive for business. But Labor and the Greens? There has been little in the way of outcry from the left. 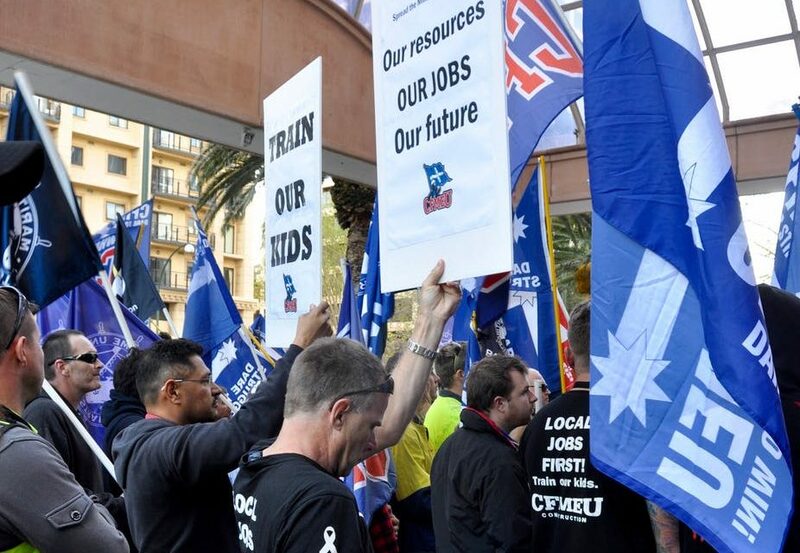 While people on the ground in the union movement are reporting serial abuse of the ABN system, the upper echelons of the Labor Party have not been vocal, despite the undeniable ramp-up of foreign contracted labour. In the face of budget cuts over the past five years, the Tax Office too has been mute. So how big is this problem? The ABN system has become a giant hole in the side of the Australian taxation system, allowing billions to escape taxation to the benefit of less ethical employers, criminals and other assorted tax evaders. Whether the tax gap from this ABN rort is in the “billions” or $1 billion is hard to tell. The Tax Office doesn’t calculate the number or, if it does, it is not saying. But the figure must be large. According to the ATO’s deputy registrar of the Australian Business Register, Michelle Crosby, there are about 7.2 million active ABNs. She said: “Over 800,000 of these were cancelled (last year) after we received evidence that the ABN holder was no longer carrying on an enterprise or through an active review of their ABN entitlement. Of the 855,000 ABNs issued in 2016/2017, around 16 per cent were issued to visa-holders. Since 2013, average annual growth in new ABN registrations ran at around 10% a year, with sole traders consistently accounting for around 60 per cent of registrations. The size of this market is mind-boggling: there are some 7.2 million active ABNs against a total workforce of 12.2 million. And some 2 million “redundant” ABNs have been removed from the system since 2014/2015, according to Tax Office data. This is not the end of the story. As contractors, ABN holders do not get worker’s compensation, leave and other benefits. They get whatever deal is struck with their employers and that can be $7 an hour. Superannuation is an interesting aspect. Anecdotal evidence suggests many foreign workers may not even be aware of super entitlements. As the employer collects this super of behalf of the worker, there is a pool of money – who knows how large – that defaults to government in unpaid super. Of the total Commonwealth tax base of $370 billion, corporate income tax contributes $75 billion versus $200 billion for individuals. So PAYG is the biggest component of the nation’s tax base and that tax base appears to be under threat. This column, co-published by michaelwest.com.au with The Conversation, is part of the Democracy Futures series, a joint global initiative between The Conversation and the Sydney Democracy Network. The project aims to stimulate fresh thinking about the many challenges facing democracies in the 21st century.